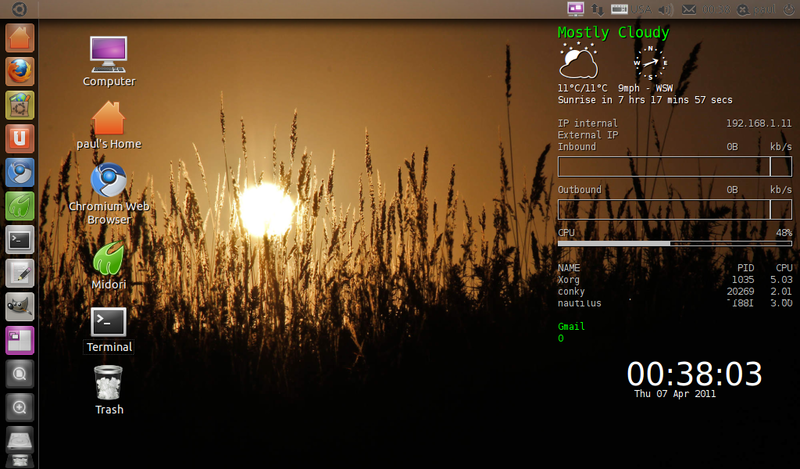 I must be really impressed with Conky as I've now gone ahead and configured a more compact version for my netbook. The screenshot shows how it looks. I did this by installing conkyforecast as detailed here and then using the conkyrc file in /usr/share/conkyforecast/example/ as the basis for my final .conkyrc. In other words, the configuration section from /usr/share/conkyforecast/example/conkyrc was largely unchanged in my final .conkyrc. I removed the more detailed forecast part from the above and displayed only the Standard Output just to save space on the tiny netbook screen. Next, I copied the .conkyrc file (the stuff under TEXT only) from the first post here and deleted what I didn't want from this. As before, I added the external IP information using the code and script described in post #2 here. The Gmail section I got from the first post in this thread. I copied the time and date part from somewhere else but forgot to make a note of from where. However, there's nothing unusual in the code. OK, here's my "slightly munged" .conkyrc (items in BOLD are munged and should be replaced by your own data).